You are here: Home / Reviews / Clothing & Jewelry / Create Custom Flip Flops with Charmmis! I love flip-flops. Not only is there something fun about the way they flip, flip, flip when you walk, but they’re also the perfect summer footwear. Comfortable enough to wear everyday and cool enough so you don’t overheat during the warm summer months. One thing I’ve struggled with in the past is finding a flip-flop that can work with virtually any of my summer outfits. Charmmis Footwear introduces a pretty and playful shoe to the market with the inter-changeable charm flip-flop made of high quality crystals and stones to give every outfit a touch of glamour. What makes Charmmis flip-flops truly unique is the ability to customize your favorite flip-flops with your favorite charm. Each flip-flop has a small hole where you can insert one of their special charms. There are over 100 different charms to choose from varying in shape (such as flowers or bows) as well as an array of crystal colors of the charms. The charms are made with cubic zierconia and/or Swarovski crystals, providing looks that range from fun to hip to elegant (yes, event with a flip-flop!) You can choose one charm that you love, or choose multiple so you can pair them with one of your summer outfits. Not only do they have a selection of charms, but they also have different flip-flop styles to choose from. They have simple flats and platforms wedges, all of which come in various colors. Prices for these flip-flops start at $16.99 and the price of the custom charms comes in at $5-$10 each, although there are some on sale for as little as $3! 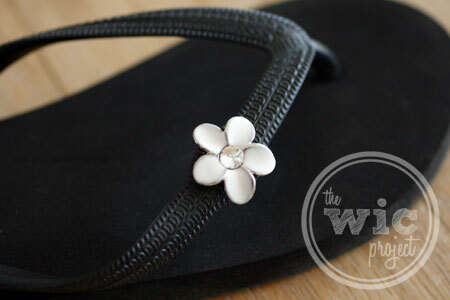 As you can see from the photos, I chose a simple black flip-flop with white crystal rose charms. There are quite a few things I noticed and loved about Charmmis, aside from the cool charms. First, they are comfortable – as in “I could walk around Disneyland all day in these and still be happy” comfortable. The soles of the flip-flops are made with a “top-secret rubber sponge recipe.” I don’t know what’s in the recipe, but that softness provides a wonderful cushion when you walk. Secondly, they actually fit. With some flip-flops, the straps are either too loose or too tight. The Charmmis flip-flops fit just right. I could actually run in these things without having to curl-over my toes like you usually have to do to keep your flip-flops on while doing anything other than stroll. I am thoroughly impressed by Charmmis flip-flops. I love that I can customize the charms according to my taste and that they are so comfortable. Quite possibly one of the most comfortable flip-flops I’ve ever worn and definitely the most flexible flip-flop when it comes to matching outfits since you can just swap out the charm! If you could customize your flip-flops, what would you do? Such a cute idea! I love wearing flip flops, and it would be awesome to just have a couple pairs that I could customize to match my outfit. Cute! Just enough to add a special touch to an ordinary summer staple.